(2009-2011) Just read to my tiny ones straight from my own Bible and eventually from The Preschoolers Bible as well when they turned 2 years old. The Preschoolers Bible is great because the language is simple enough for a 2 year old to understand. My Favorite Bible is more geared towards 3 or 4 and up, and the descriptive language and creative storytelling is wonderful. We use Read-Aloud Bible Stories volumes 1-4, as well as volume 1 of The Tell Me Stories, both written by Ella K. Lindvall in such an amazingly perceptive, wise way–yet, in repetitive and enthusiastic toddler language that doesn’t get any simpler (making it great for read aloud). The illustrations are simple, but always interestingly drawn from a unique perspective. I have found that Lindvall’s books are the only illustrated toddler Bibles large enough to hold the attention of a group of children because everyone can see the pictures. Of course I like the Jesus Calling Bible Storybook because I personally use Sarah Young’s Jesus Calling awesome devotional for adults. In the children’s version, there is a short devotional at the end of each Bible story that is written as if Jesus is speaking directly to the reader. This one is best for ages 4 and up. (2013-2014) By the looks of the cover, I would never have picked up The Child’s Story Bible, but trusting the recommendation from simplycharlottemason.com, went ahead and bought it after reading lots of good reviews. Well, the saying “don’t judge a book by its cover” is applicable here! I LOVE this Bible for kids (and grown ups)– once you feel like they are ready to hear a very detailed account of all the stories in the Bible. It covers the whole Bible chronologically, missing only the passages that might not be suitable for children. It’s beautifully written in a narrative style. I have learned so much by reading this Bible storybook to my kids!! Oh, and Noah, my 5 year old, has too. 😉 He seriously knows the Bible stories better than I did when I was 12 years old thanks to the regular reading of this story Bible (and I was raised in a Christian home and church all my life!). Just be aware that The Child’s Story Bible tells all the wonderful favorites included in most children’s Bibles, but also tells the less popular stories about the Israelites’ sins and battles (minus sexual and graphic information). If a family desires to shield younger children from narratives of battle details, this would not be the right Bible. For children who are ready, The Child’s Story Bible is great, especially for ages 5 and up. 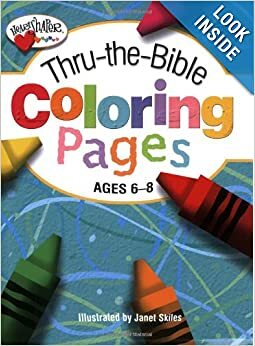 To keep their hands busy while mommy or daddy read The Child’s Story Bible, and to make Bible time both a listening and a fine motor lesson, we have our 3 and 5 year old color away in binders where we store “Thru the Bible Coloring Pages”. Its great how the coloring pages match up so nicely with the stories in The Child’s Story Bible. When there is no matching coloring sheet, we add a blank sheet of paper to to the binders for them to draw something from the story (narration! ), which is great too. Half the stories end up matching a coloring sheet, and so the other half are drawn out on blank sheets. Its definitely nice having the variation. On a side note, Noah has reeeeeally improved in his coloring this year as a result of daily Bible binder work, which of course helps with writing too, as coloring strengthens all the hand’s small writing muscles. (2015 and Beyond) Please see “Annual Curriculum Plans” under “Categories” on the side bar to find out how I have taught Bible since the children became school age.